A. B. Armstrong, druggist, Smethport, is a son of Alexander and Julia Armstrong, and was born at Cuba, Allegany Co., NY, in 1838. His parents were originally from Seneca county, NY, but removed to Allegany county about 1880, being among the pioneers of that county. They were married at Nunda, Livingston Co., NY Alexander Armstrong was a cabinet maker by trade, and for many years resided at Cuba, NY; he was also a contractor, engaged upon the construction of the Erie Canal, but moved to Rushford, Allegany county, in 1849, and went west in 1860, locating in Iowa. They reared a family of eight children, of whom but three are living: A. B., M. L. (a merchant in Smethport), and Alice (now Mrs. J. L. Anderson, of Kansas). A. B. Armstrong completed his education at Rushford Academy, Allegany Co., NY, and in 1854 became an employee of Joseph Hyde, of Ridgway, PA, with whom he remained about a year; then was clerk in a store and hotel for James M. Miller at Smethport, and later with Ford & Smith, merchants. In 1857 he became associated with Gideon Irons in the purchase of the grocery store of H. F. Williams, and the general store of Ford & Smith, the firm name being Irons & Armstrong. He continued in business for about two years, when he sold his interest to his partner and began the study of law with John C. Backus, of Smethport, being admitted to the bar in 1861. He, however, never became a practitioner, and that year found him in the grocery trade as the senior member of the firm of A. B. Armstrong & Co. In this he was engaged until 1866.
county at that date. In 1869 he was elected a member of the legislature, representing the counties of Clinton, Cameron and McKean, which necessitated a dissolution of partnership, and since his return to private life he has been in business alone. In 1860 Mr. Armstrong married Carrie, daughter of David R. Bennett, and they have one child, Ethel. Mr. Armstrong is a member of McKean Lodge, No. 334, F. & A. M., and of the Chapter at Olean. Politically he is a Democrat. Mr. Armstrong is practically a self-made man, and in the evening of his years enjoys the fruits of a successful business career, having the esteem and confidence of the community generally. Domestic in his tastes, he has never, with but one exception, accepted positions of a political nature which tended to separate him from the home circle, although he served as justice of the peace for ten years, and was a member of the borough council many terms; an active member in the Rose Hill Cemetery Association, holding the position of treasurer for the last twenty years; was also among the first to organize the Smethport Water Company -securing to Smethport one of the best systems in the State being the treasurer and manager and director from its first meeting; he was also among the first citizens of Smethport to secure and make successful the Smethport Gas Company, which supplies the borough with fuel-being its treasurer and managing director; also any enterprise with which Smethport was to be benefited found in Mr. Armstrong a champion and an earnest supporter. He is contented with his lot, and is the owner of the oldest drug store in McKean County. Corner Drug Store, Oldest in County Passes From Existence With Sale Walter Brenneman, who recently acquired the old-established Corner Drug Store, has changed the name to "The Corner." Mr. Brenneman has no intention of dealing in drugs, confining his activities to the restaurant, tap room and soda fountain departments. It is understood he will sell the large stock of drugs. The Corner Drug Store building was destroyed in the Main street fire of January 21, 1933, and the handsome new brick structure was promptly erected by the proprietor, Dr. W. A. Ostrander. With the recent change of ownership, McKean county's oldest drug store went out of existence. 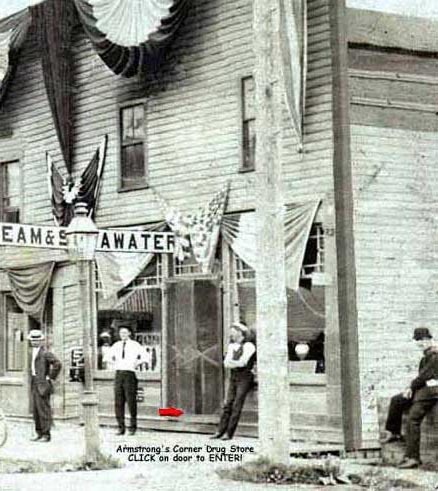 The Corner Drug Store was established in 1868 by Dr. F. W. Hogarth, father of L. K. Hogarth of Smethport. Dr. Hogarth, a native of England, graduated from the medical school of the University of Buffalo. He had a distinguished record of service in the Civil War under Dr. S. D. Freeman surgeon of the famous Bucktail Regiment. The Corner Drug Store later was operated by Hogarth and Seems until 1872, when it was sold to A. B. Armstrong. 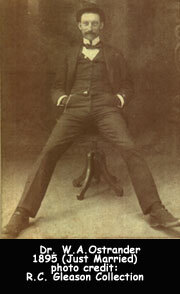 Mr. Armstrong sold the store to Dr. Hogarth's son, L. K. Hogarth, in 1893. 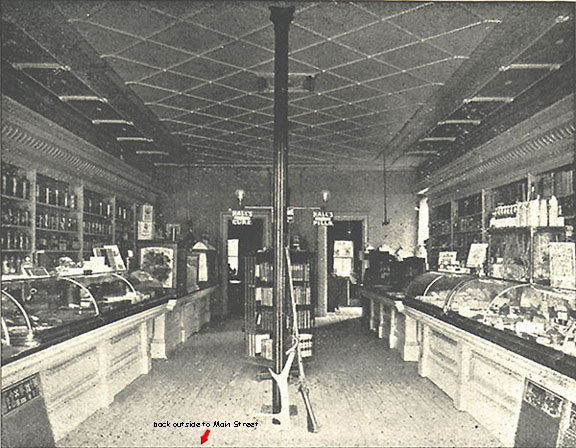 Dr. Ostrander purchased the store from Mr. Hogarth in 1920. During the long years of operation, the Corner Drug Store became one of the town's best known landmarks. It has served untold thousands of patrons in its sixty-eight years. A new arrival at A. B. Armstrong's. My stock is full and complete, and selected from the best in the market. Call and exam in price and quality, and you will not fail to buy. Statistics show that one in four people have a weak or impaired heart. The first symptoms are a shortage of breath, fluttering, faint and hungry feelings, pain in the side, then a tug, swollen ankles, drospy, for which DR. MILES' NEW HEART CURE is a marvelous remedy. "I have been troubled with heart disease for years, my left pulse was very weak, could at times scarcely feel it, the smallest excitement would always weaken my nerves and heart and a fear of impending death stared me in the face for hours. DR. MILE'S NERVINE and NEW HEART CURE is the only medication that has proved of any benefit and cured me."-L. M. Dyer, Cloverdale, Md. Dr. Miles' Liver pills are a sure rememdy for Billonantes and Torpid Liver. Free from the druggest or the address. DR. MILES MEDICAL CO. Elkhart, Ind. Sold by A. B. ARMSTRONG.